Exclusive: Government figures tell Business Insider they expect May's pro-Brexit opponents to fold under increasing pressure from Conservative whips. Senior figures in Theresa May&apos;s government tell Business Insider they believe pro-Brexit rebel MPs will ultimately fold and support her Brexit deal. They predict the fear of a second referendum and a tough whipping operation will bring Conservative MPs in line. However, furious pro-Brexit MPs deny this and tell Business Insider that May will suffer a leadership challenge within weeks. "She is incredibly sneaky and backstabbing. She&apos;s quite conniving. It’s like the dying days of Thatcher where she wouldn&apos;t listen to anyone," one Tory Brexiteer tells BI. 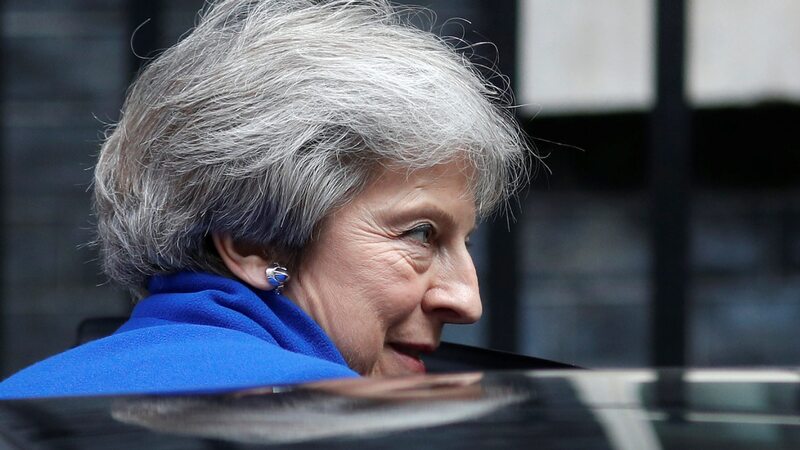 LONDON — Theresa May is piling the pressure on pro-Brexit Conservative MPs to vote for her Brexit deal, as one Tory MP told Business Insider that they expect her to face a leadership challenge within weeks. More than 50 Conservative MPs from the pro-Leave European Research Group have joined the "Stand Up For Brexit" organisation which is opposed to the prime minister&apos;s handling of negotiations and Chequers proposals. However, a minister in May&apos;s government told BI that the threat of a possible EU referendum if a deal agreed in Brussels is defeated in Westminster, combined with an aggressive whipping operation, will ultimately convince Tories who oppose May&apos;s plan to vote for it. "One of the unintended consequences of the campaign for another referendum is it that it has scared Brexiteers into backing a Chequers-style compromise deal," the minister said. Another influential Conservative MP agreed, telling BI that Brexiteers would not want to risk re-opening the question of whether Brexit should go ahead. I&apos;m amazed we haven&apos;t reached [the 48 letter threshold for toppling May] yet. But it will come… in the next few weeks. "Are they [the ERG] really going to put it all at risk in the final moments, the dream they have spent their whole lives pursuing, just because it isn&apos;t 100% perfect?" the MP asked. However, a senior member of the ERG told Business Insider that pro-Brexit MPs would hold firm against the deal. "I should look at those MPs who have pledged to Stand up for Brexit because there are over 50 of those and that pledge means you are not going to vote for Chequers or any derivative of it," Andrew Bridgen MP told BI. "I think a large majority of ERG members will find they are unable to vote for a deal that will put £39 billion for the promise of a deal in the future." Bridgen dismissed the idea that pro-Brexit MPs would abandon their principles due to pressure from whips. "They&apos;ve not tried that tactic with me but it wouldn&apos;t surprise me. They tried that with the Maastricht rebels and I think Iain Duncan Smith went quite far in the party didn&apos;t he?" Bridgen was backed by another ERG MP, who told BI: "Ministers are either are flying a kite or trying to flush out MPs who could be going wobbly. But it’s going to fail because they need concrete evidence. "The public statements ERG members are making [against May&apos;s Brexit plans] are only getting stronger." Bridgen, who has already submitted a letter to Conservative party authorities calling for a vote of no confidence in May, told BI that he expected the threshold for a leadership challenge to be met within weeks. "I&apos;m aware of at least two letters of no confidence that have gone in since the 1922 committee the week before last," Bridgen told BI. "I&apos;m amazed that we haven&apos;t reached [the 48 letter threshold] yet. But it will come… in the next few weeks." I don’t want to be a PPS or minister in this shambles. The Conservatives&apos; whipping operation has stepped up in recent weeks with pro-Brexit MPs put under increasing pressure to remain loyal. One Conservative MP predicted that pro-Brexit Conservatives with ministerial ambitions will gradually "peel away" in the coming weeks under pressure from government whips. "The whipping operation will smarten up and various other offers will be made," they said. "If you vote against the government then you lose your PPS role and if you believe you are in a chance of potentially becoming a minister at some point then that is a pretty brave move," they added. However, a member of the ERG told BI that while they had been warned by whips that they&apos;d lose their job as parliamentary private secretary if they opposed May&apos;s deal, "I don’t want to be a PPS or minister in this shambles [anyway]." Another ERG member told BI that pro-Brexit MPs were simply too furious with the prime minister&apos;s handling of Brexit to ever back her plans. The MP, who attended the most recent 1922 committee meeting of Tory MPs, said they were "so, so angry" with May, who they believe "has made clear that she has no intention to work with the ERG anymore." [May] is incredibly sneaky and backstabbing. She&apos;s quite conniving. It’s like the dying days of Thatcher where she wouldn&apos;t listen to anyone. They added that the recent meeting — which was reported as an outpouring of support for the embattled prime minister — was "so stage-managed" with pre-arranged questions "so there was no room for dissent." They told BI: "The ERG had been working with the prime minister and Number 10 and she admitted making mistakes earlier in the negotiations. It was promising. She had shown a willingness to listen to us. "The ERG literally pulled letters from Graham Brady because they thought she [May] was willing to work with us. But she has completely turned back on her promise, and we are back to where we were before." They added: "She [May] doesn&apos;t come across as sneaky but she is incredibly sneaky and backstabbing. She&apos;s quite conniving. It’s like the dying days of Thatcher where she wouldn&apos;t listen to anyone." Meanwhile, a senior source within the People&apos;s Vote campaign has told BI that "two or three" pro-EU Conservative MPs are set to be officially unveiled as the group&apos;s newest supporters later this month. The MPs — who are currently deliberating when to make their announcements — will join their Tory colleagues Anna Soubry, Sarah Wollaston, Justine Greening, Philip Lee and Guto Bepp, who all support another Brexit referendum. A junior minister told BI that they belong to a significant group of Conservatives MPs who would support another referendum if the UK risked leaving the EU without a deal in March next year. "If the choice was between a referendum and no deal, I’d go for a referendum," they said, adding that Tory Remainers like Lee "are right" to claim that numerous Tory MPs privately support another nationwide vote. Lee, who quit the government earlier this year to criticise May&apos;s handling of negotiations, told a Conservative conference fringe last month that three ministers privately back another Brexit referendum.